Turn your scrap glass into great kiln melts. 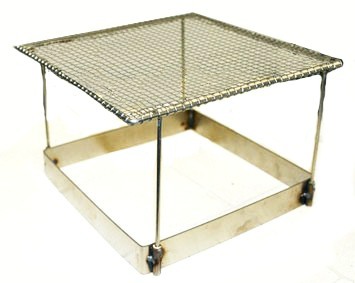 This system includes a tough and rustless stainless steel melt screen and stainless steel mold in one inter-connected unit. Just place the unit in your kiln, add some fiber paper into the mold, place scrap onto the screen and fire. Viola! You come out with great looking glass. It is 7.5" square and will fit into an 8" kiln. There are two separate sets of legs for either 3" for 5" height.